Add the protocol to check and modify RTC time. <time stamp> is only the sec part of POSIX time_t. <Data Block Number>: "N=1" - "N=4294967295" unsigned 32 bit integer. Of course, it will not get this big. 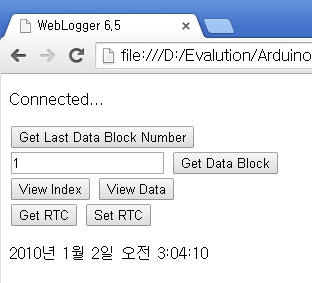 In the Data Log Code - Arduino Web Logger posting source code, SD_BASE_BLOCK becomes 0. <time stamp> is only the sec part of POSIX time_t. Do *1000 since we don't use millisecond part. Of course it will be very difficult to see "T=4294967295" in our lifetime. <data> is in +dd.ddd format. "D=-99.999" termination. That certain Data Block send is completely finished. n is channel number between 0 to 7. There is no reply. When you send "DI", it replies with "bbbbbbbb". b represents each input channel, and it becomes either '0' or '1'. When you send "AIn", it replies with "+dd.ddd". n is channel number between 0 and 7, and "+dd.ddd" is from -10.000 to +10.000. 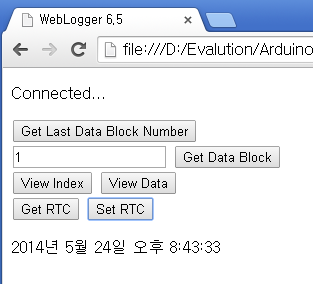 When you click [GetRTC] button display RTC time. The incorrect RTC time gets set to current time when [SetRTC] button is clicked. // Locale standard is GMT. // In order to view as Korean time, we need to -9 hrs. // GMT problem. Ths time +9 hrs.